See the amazing talents of SIX real-life brothers at this inspiring show, where every sound you hear comes from the mouths of the performers. The sounds of instruments (drums, bass, and others) and beautiful harmonies coming from the six vocalists creating a cappella versions of timeless songs. Considered an 'orchestra of human voices', this is an awe-inspiring show that you won't want to miss while in the Ozarks. Hear music of all kinds, including hits from the Beach Boys, Elvis, Journey, and even Motown. The fabulous dance numbers will have you clapping, smiling, dancing, and singing along. 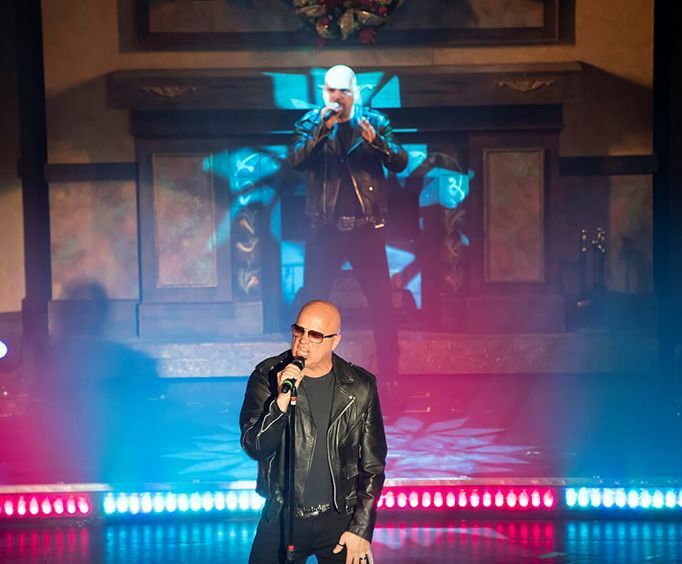 This show seamlessly combines powerhouse vocals, high-energy performers, and family-friendly humor— you'll be wishing it never ends! SIX is made up of six brothers (the oldest of ten) who each have a natural gift for music. The brothers started by singing gospel music at their church before starting to create their own melodies and perform at community events and talent contests. Once they started becoming popular, SIX made their television debut on the Donnie and Marie show in 1978. The group did make a move out to Southern California to chase their dreams and while they did struggle for a while attempting to live off street performances, they eventually started landing steady gigs to perfect their sound. Since 1995, performing has been SIX's full-time career. This dynamic group took their love for music and created a home here in Branson, MO, now performing at the Hughes Brothers Theatre. Barry Knudsen: The oldest brother. Known for his falsetto and rich mid-range. Distinctive mouth made horn. Kevin Knudsen: The second oldest brother. Makes crazy sound effects you won't believe come from his mouth! Lynn Knudsen: The third-born brother. His rich vocals create authentic impersonations of artists such as Frank Sinatra and Louis Armstrong. Jak Knudsen: The fourth son, also known as 'Bass Man'. Provides all the rhythmic bass. Owen Knudsen: The fifth oldest son. Has an incredible vocal drum complete with spot-on rhythm and a baritone voice. Curtis Knudsen: The youngest of the performing brothers. Creates an amazing vocal electric guitar paired with his tenor vocals. 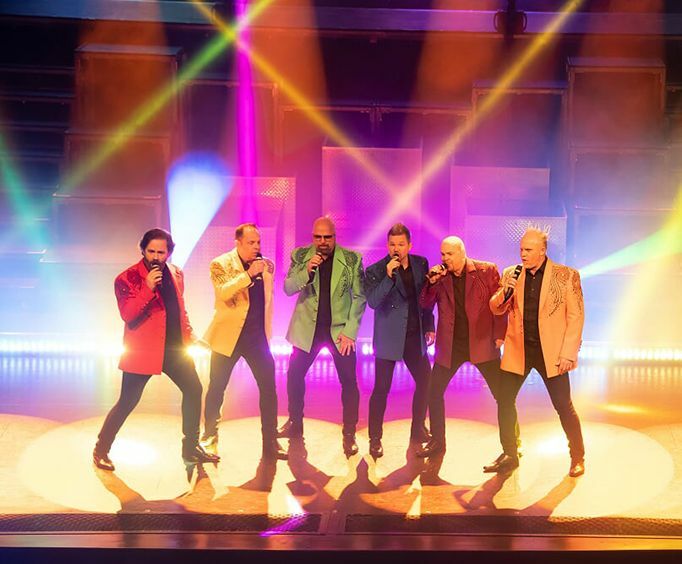 From their premiere performance on the Donny & Marie Show to their fantastic shows in Branson, these brothers have been very successful at entertaining crowds. Come see SIX and let the Knudsen brothers (Barry, Kevin, Lynn, Jak, Owen, and Curtis) entertain you with their amazing voices and impeccable stage presence. You will have a night not easily forgotten when you experience the talented vocals of SIX. Approximately how long is the SIX Branson? The show is held at the Hughes Brothers Theater. Do the performers of the SIX Branson sign autographs and meet the audience after the show? Yes. After the show, guests can meet and greet with SIX in the theater lobby. What is the length of intermission at SIX Branson? We just returned from a bus trip to branson after spending 3 days, 2 nights and seeing 5 different shows. I can tell you right now that the best show by far was six. The show was fabulous and the brothers were the greatest. They even came out to see out limousine bus and visited with our group. We will be telling every one how wonderful we were treated as well as seeing a wonderful show. I bought their 3 cd's and hope they come out with more. My husband and i took our 15 year old grandson to see six! What a fantastic evening of entertainment! From the first note to the last we enjoyed every song.